The name deer botfly (also deer nose bot) refers to any species in the genus Cephenemyia (sometimes misspelled as Cephenomyia or Cephenemya), within the family Oestridae. 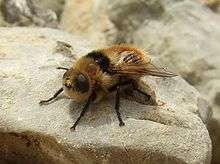 They are large, gray-brown flies, often very accurate mimics of bumblebees. They attack chiefly the nostrils and pharyngeal cavity of members of the deer family. The larva of Cephenemyia auribarbis, infesting the stag, is called a stagworm. The genus name comes from the Greek kēphēn, drone bee, and myia, fly. The larval stages of Cephenemyia are obligate parasites of cervids. Eggs hatch in the uterus of the female. She then flies close to the head of her host species and while hovering ejects her larvae into its nostrils. Larvae migrate to the base of the animal's tongue, where they mature in clusters to a size of 25 to 36 mm. After being ejected by the host, they pupate in soil (2 to 3 weeks) before emerging as a sexually-mature but non-feeding adult, which must quickly find a mate, since its life is short. However, without any exception, stags are found to have maggots living inside the head, and the habitat of these creatures is in the hollow underneath the root of the tongue and in the neighbourhood of the vertebra to which the head is attached. These creatures are as large as the largest grubs; they grow all together in a cluster, and they are usually about twenty in number. Species found in the United States include C. apicata, C. jellisoni, C. phobifer, C. pratti, and C. trompe. In Scandinavia, the only species present are C. trompe and C. ulrichii. Other European species include C. auribarbis, C. pratti, and C. stimulator. Fastest of all flying insects? It was reported for many years that Cephenemyia was the fastest of all flying insects, cited by the New York Times and Guinness Book of World Records as traveling at speeds of over 800 miles per hour. (For comparison, the speed of sound in air is 768 miles per hour.) The source of this extraordinary claim was an article by entomologist Charles H. T. Townsend in the 1927 Journal of the New York Entomological Society, wherein Townsend claimed to have estimated a speed of 400 yards per second while observing Cephenemyia pratti at 12,000 feet in New Mexico. The impact trauma of such a fly colliding with a human body would resemble that of a gunshot wound. Using the original report as a basis, Langmuir estimated the deer botfly's true speed at a more plausible 25 miles per hour. The latest edition of Encyclopaedia Britannica cites a speed of 80 km (50 mi) per hour for this fly. Time magazine published an article in 1938 debunking Townsend's calculations. But the New York Times, which ran a story in 1937 on "the fastest creature that lives', has not yet published a correction. ↑ Stagworm - Definitions from Dictionary.com. From Webster's Revised Unabridged Dictionary, © 1996, 1998 MICRA, Inc.
1 2 Nilssen, Arne C.; Marja Isomursu; Antti Oksanen (2008). "The moose throat bot fly Cephenemyia ulrichii larvae (Diptera: Oestridae) found developing in roe deer (Capreolus capreolus) for the first time". Acta Veterinaria Scandinavica. 50: 14. doi:10.1186/1751-0147-50-14. Retrieved 22 June 2011. 1 2 3 4 "Deer Nose Bots". Michigan Department of Natural Resources. Retrieved 22 June 2011. ↑ Aristotle. History of Animals. ↑ National Honors Report, Summer 2002. Pages 3-4. Honors Program - Tennessee Technological University. ↑ Townsend, C. 1927. On the Cephenemyia flight mechanism and the daylight-day circuit of the Earth by flight. J. New York Entomol. Soc. 35: 245-252. ↑ Deer nose bot fly, or Cephenomyia (insect) -- Britannica Online Encyclopedia. ↑ Botfly Debunked - Time. Mar. 21, 1938. Cephenemyia- Throat or nose bot. Northern Land Use Institute @ University of Northern British Columbia - Prince George, BC, Canada. DNR - Deer Nose Bots. State of Michigan, Department of Natural Resources. Nasal Bots in Deer: Harmless but Irritating. Nan K. Huff, Louisiana Department of Wildlife and Fisheries.